2015 was a challenging year due to unseasonal weather patterns however I gave it my best covering hundreds of miles during the day and night chasing natures best transient phenomena. 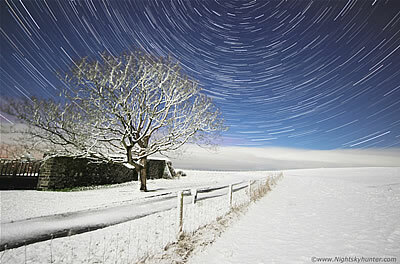 This is also the year that I began serious time lapse photography which will feature greatly in my future work. 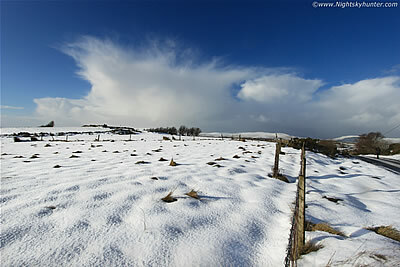 The highlights of the year include the Tyrone Stags in snow, the Enniskillen low topped supercell which came close to dropping a wedge tornado, two episodes of gorgeous sunset mammatus clouds from Maghera, the many storm chases and beautiful aurora displays from castles in Fermanagh and along the Antrim coastline. View the images and relive the adventures through these 22 reports which document my finest moments of 2015. 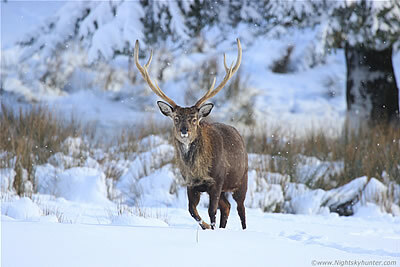 On January 29th 2015 I woke to a beautiful snow fall then spent the day chasing over the hills of Co. Tyrone driving over snow-covered mountain roads and drifts before encountering a field of stunning Stags and Sika Deer in deep snow for the second time this Winter. The Stags with their majestic antlers against a backdrop of pristine snow in perfect light looked like a scene straight from Canada. Following this we got hit by chunks of falling ice from the tree tops impacting the van roof during a forest drive to Lissan House in Cookstown. After sunset I relocated to the north coast and spent the first part of the night hunting lightning over the ocean in wild weather conditions with squalls, sleet and hail stones accompanied by horizontal sand and foam making for a thrilling day and night of non stop weather action and photography. One page report with 20 images and 1 video clip. - REPORT. A nice Winter memory and local snow chase with my Fiance on the mountain roads between Draperstown and Moneymore on January 31st 2015 when we experienced a selection of beautiful and severe weather on a day of Polar air and strong Nly flow which produced a wind chill of -15C. A walk in the area lead to the discovery of Ballybriest stone tomb and a thrilling venture across snow covered fields like the Arctic, the snow blanket itself was covered with millions of frozen hail stones. The landscape was lit by a bright sun with a deep blue sky aloft with periodic bombardment from cells producing squalls of hail and snow into local blizzard-like conditions. One page report with images 7 and 1 video clip. - REPORT. 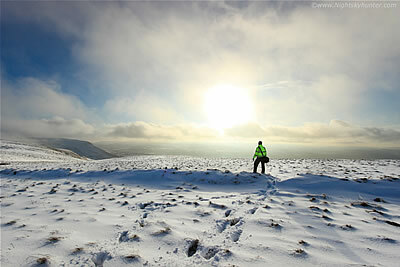 A wonderful Winter memory on February 2nd 2015 when my Fiance and I hiked up Benbradagh mountain outside Dungiven in the snow and reached the 1500ft summit to be treated to an epic view across pristine snow fields with drifts and rime ice lit into surreal brilliance by a blazing Winter sun surrounded by an orange corona and all contrasting against a deep blue sky in the freezing Polar air. One page report with 9 images and 1 video clip. - REPORT. The third cold spell of the season affected N. Ireland on March 2nd and 3rd 2015 with a cold and very unstable Wly/NWly air mass from Canada which generated numerous snow storms and a great variety of Winter phenomena. I hunted for inland snow scenes during daylight hours and for convective ocean storms during the night on both days. Highlights were the surreal moonlit snow scenes at the north coast, the moonlit star trail imagery over Downhill and Mussenden Temple in pristine snow, the sheared moonlit ocean convection and an insane blizzard encounter on Brieen road where my Dad and I experienced severe winds, white outs and fast blowing snow so dense that my van vanished from view before my very eyes. One page report with 19 images and 2 video clips. - REPORT. The skies turned green on St. Patrick's night March 17th 2015 when a CME impact generated an unexpected severe G4 geomagnetic storm peaking with a KP level of 8. 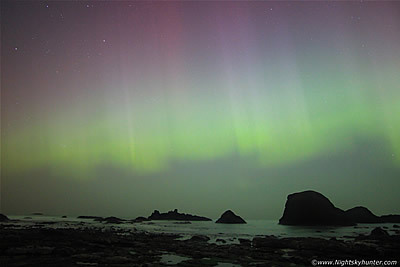 This report documents the lead up to this event including images of the aurora itself captured from Ballintoy Harbour on the Co. Antrim coast as we battled with mist and haze to witness the finest aurora storm of the current solar cycle. We experienced three outbursts however the climax took place after 23.00 UT when the aurora turned epic sporting multi-coloured rays streaming past the zenith into the southern sky followed by the formation of a rare corona which I have not observed since the extreme aurora storms of 2002-2003 followed by another 02.00 outburst from the Giant's Causeway which made for an unforgettable night. One page report with 11 images and 1 time lapse video. - REPORT. The grand finale of the 2015 Spring aurora season happened on April 16th when a G2 geomagnetic storm was generated by a fast moving solar wind stream which took everyone by surprise. 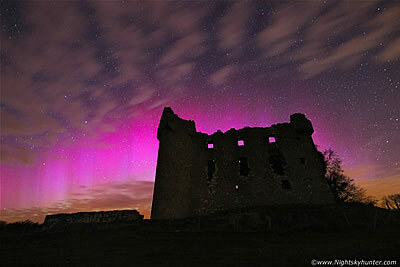 I met up with photographer Paul Martin and together we drove into the beautiful countryside of Co. Fermanagh and photographed the stunning aurora over the ancient ruins of Monea castle near Derrygonnelly, the first time this has ever been done, and watched in awe as a vibrant pink and purple aurora surrounded the castle with angelic beams of light up to 40 degrees high. This night made the entire aurora season for me on both a personal and photographic level. This detailed report also documents a fox encounter, a faint aurora from Downhill beach the previous night and a wonderful sunset from Kildress church outside Cookstown. One page report with 16 images and 3 time lapse videos. - REPORT. 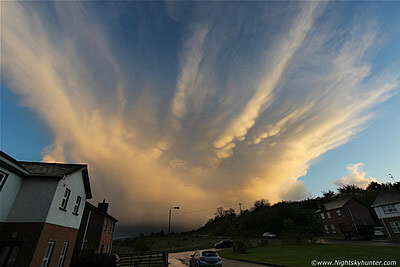 A sudden and unexpected treat happened on May 11th 2015 when a cell passed over my home town of Maghera at 21.00 which produced a stunning widespread mammatus display on the back of a sheared anvil all it into vivid orange and golden colours by the setting sun which extended across 180 degrees of sky. After a last minute drive into the Maghera countryside adjacent to the Crewe Road I captured a succession of dramatic wide angle images of the display in perfect light with the clouds surrounded by clear blue sky in conjunction with Go Pro footage which made for spectacular end to the day. One page report with 13 images and 1 video clip. - REPORT. During the late evening of May 18th 2015 I was working on video editing in my room after a local chase earlier in the day when between 20.30 and 21.00 UT I felt a sudden impulse to glance out my window which revealed a stunning sunset sky show unfolding. I ran into my front garden and was instantly treated to the best mammatus cloud display I have ever seen with large udders arranged in streamers on a fanning wispy anvil all lit into glorious gold and yellow colours by the setting sun. For ten delightful minutes I watched and photographed the cell as it passed over Slieve Gallion with US-style mammatus hanging over Maghera before it passed over Lough Neagh and vanished into the darkness of dusk accompanied by several departing rumbles of thunder marking the second time a sunset mammatus display passed over my home area within a week. One page report with 15 images and 1 video clip. - REPORT. On June 22nd/23rd 2015 multiple CMEs impacted the Earth's magnetosphere generating a freak G5 geomagnetic storm peaking at KP9 with a Bz tilt of almost minus 40. 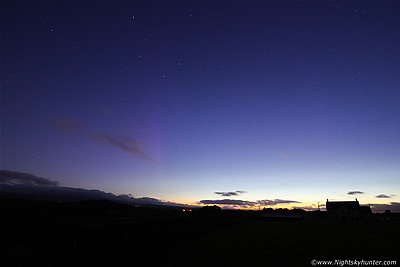 Despite the severe challenge of seeing anything at all through the intense Summer twilight sky this close to the Solstice I was astonished to witness several naked eye aurora beams over 40 degrees tall slowly meandering through the twilight arch in ghostly fashion from a hill in the Maghera countryside. This was an extremely rare event which I haven't witnessed in over 18 years of aurora watching and to also get it on camera made this an unforgettable memory and the highlight of the Summer night sky this season to date. Also included is a wall-cloud type lowering under the base of a storm cell over the fields adjacent to Maghera on June 24th exhibiting keen inflow motion. One page report with 4 images and 1 time lapse video. - REPORT. A fun storm chase with Roisin on July 5th 2015 watching two thunderstorms from the top of Benbradagh near Dungiven. The second storm was observed from birth as it built cloud by cloud into a cell with a large textured updraught base which then began rumbling and producing lightning. We chased the storm N and punched through its strong precip core of rain and hail then encountered twin close range rapid fire lightning bolts striking the ground outside Garvagh, the cell then went on to cause flooding and damage to a bridge in Ballycastle. A 7 & 1/2 hour storm hunt which finally broke the long thunder drought. One page report with 12 images and 2 video clips with time lapse footage. - REPORT. July 6th 2015 turned out to be the most thrilling chase day of the season to date when a warm sector low-CAPE high-shear set-up generated a risk of tornadoes across Ireland and even low topped supercells. I took my Mother chasing and between 17.30 and 17.45 UT we encountered a low topped supercell with incredible large scale rotation with a tornado in the form of a rotating wedge trying to plant on the edge of Enniskillen, as we watched in awe a hook echo formed on radar as cloud and precip with a possible wet RFD swept across our field of view. 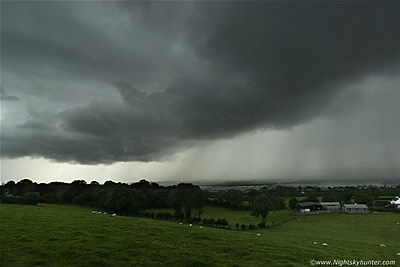 The chase then took us to Omagh where we encountered a dramatic rotating updraught base and punched a core of intense rainfall with weak ground circulation embedded within. Over 8 hours chasing this day and the closest I have ever come to a strong tornado forming in this country, a day I will never forget. Mostly video grabs used to document this chase. One page report with 25 images & 2 video clips. - REPORT. 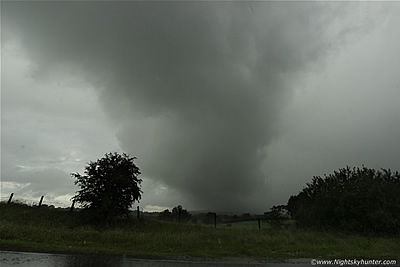 August 5th 2015 storm chase in a low CAPE-high shear set-up through parts of Co. Fermanagh and Co. Tyrone. During the evening hours an intense N-S convective line formed across a large area of the country sporting torrential rainfall containing red and white radar echoes. 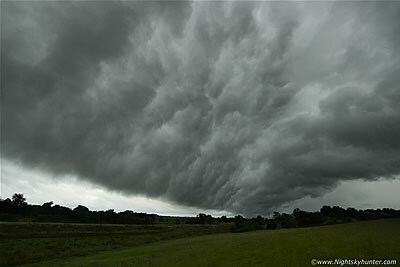 After hours of waiting and changing position we finally emerged from the vast precip core in Co. Tyrone into dry air and encountered a massive gust front with an impressive all-sky whale's mouth display with lightning and loud thunder which made for a dramatic sight as the storm swept across the lush countryside near Omagh in the evening light. One page report with 7 images and 1 video clip. - REPORT. 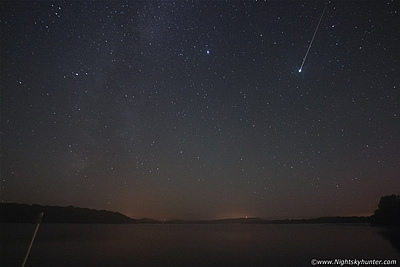 On August 12th 2015 we did an all night Perseid meteor shower watch from a jetty located at a terrific viewing location across Lower Lough Erne in Co. Fermanagh. Despite weather concerns earlier in the evening we got treated to pristine clear skies for the entire event and logged an astonishing 477 Perseids including several fireballs making this the best Perseid meteor shower we have ever observed to date, the thrilling night was complimented by a vibrant Milky Way and even a surprise faint aurora with rays across a lake covered in a blanket of mist. One page report with 12 images. - REPORT. A fun afternoon chase through the country roads on August 29th 2015 near Ballymena. A storm was spotted far away to the SW so we moved to a strategic position deep in the countryside on a hill and had the luxury of watching a developing thunderstorm form over Moyola then trek NE over the River Bann, Portglenone then clipping Ballymena town. The storm looked mean and majestic over the lush fields with a compact but strong precip core with red and white echoes on radar. When the storm hit it delivered heavy rainfall, overhead bolts and very loud long duration rumbles of thunder. We chased the cell further NE and watched its flanking area pass over Slemish mountain with new daughter cells bubbling up in the warm afternoon sun. 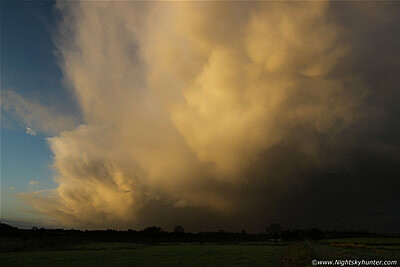 The report also includes a beautiful cell with segmented rainbow from Maghera on the 27th. One page report with 9 images and 2 video clips. - REPORT. On September 9th 2015 I spent a serene night and solo shoot at the Giant's Causeway on the Co. Antrim coast photographing a beautiful G1 aurora display from this famous 60 million year old location. 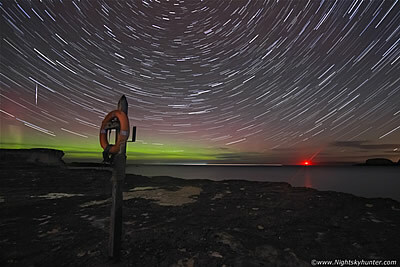 The aurora exhibited several outbursts with wonderful purple and red rays reaching over 30 degrees high from a vibrant green glowing band surrounded by stars. The night was very dark, moonless and 100% clear with barely a cloud in sight allowing me to shoot several star trails and time lapse footage with my DSLR and Go Pro cameras. One page report with 9 images and 1 time lapse video clip. - REPORT. 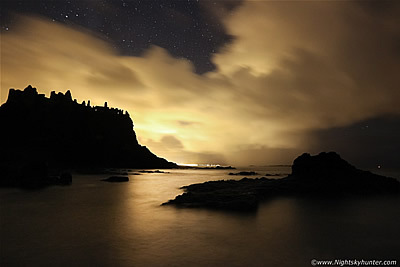 New report documenting a series of late night photo shoots spread over a two week period at Dunluce Castle with photographer John Fagan shooting hours of time lapse footage and star trails at the Co. Antrim coast during September 2015 using several cameras and lenses on location. These shoots took place under dark skies then ended in bright moonlight with a surprise aurora outburst witnessed during the course of one such castle shoot. One page report with 8 images and 2 time lapse videos. - REPORT. 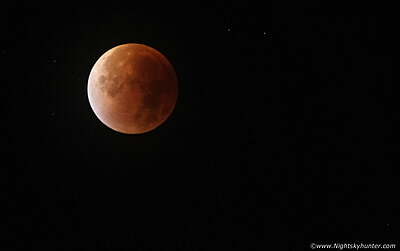 During the early morning hours of September 28th 2015 a rare perigee total lunar eclipse occurred in N. Ireland skies in conjunction with an even more rare clear night. After setting the alarm my fiance Roisin and I woke at 02.30 in the morning and watched the spectacle together from my Dad's garden in Cookstown where we got treated to a sublime visual show. This was the darkest totality I had ever witnessed and during the climax of the umbral passage the landscape turned exceptionally dark with Milky Way and M31 easily visible to the naked eye, the eclipsed moon itself looked like a dark 3-D globe within Pisces with subtle red, orange, blue and black colour hues. The night was silent, exceedingly atmospheric and a great memory which we shall never forget. One page report with 6 images and 1 video clip. - REPORT. 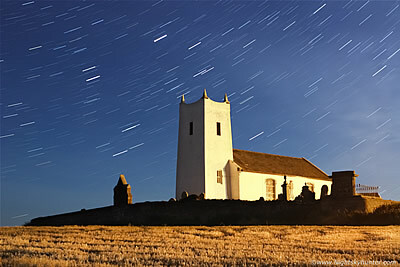 On September 30th 2015 during moonrise I photographed star trails over Ballintoy church then met up with John Fagan and spent the night shooting star trails and time lapse of the 60 million year old coastline at Elephant Rock between Ballintoy and White Park Bay beach under bright moonlight with multiple cameras on a beautiful starry night along the Co. Antrim coast. On the following night October 1st I joined Paul Martin and together we ventured into Co. Donegal and spent a very atmospheric night shooting the Milky Way and moonlit star trails around and within legendary Dunlewey church at Poisoned Glen followed by a stunning moonlit fog scene shoot late in the night at Mt. Errigal. One page report with 21 images and 1 time lapse video. - REPORT. On October 7th 2015 two solar wind streams in conjunction with a co-rotating interaction region generated a strong G2 geomagnetic storm which showed itself to the naked eye at dusk even before the sky got dark. 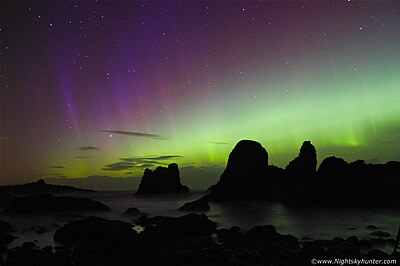 I met up with photographer John Fagan and together we shot the aurora from 60 million year old Elephant Rock near Ballintoy on the Co. Antrim coast with five cameras shooting time lapse footage and star trails with various lenses. The aurora went into an early outburst producing a twin tier band with vivid green colours illuminating the ocean complimented by a multitude of fast moving rays and spikes which completely blew us away. The report also documents two more aurora hunts along the coast on October 8th and 13th. One page report with 14 images and 2 time lapse videos. - REPORT. On October 31st 2015 John Fagan and I spent Halloween night doing a photo shoot at the Co. Antrim coast shooting star trails, time lapse video and patrolling for Taurid fireballs. 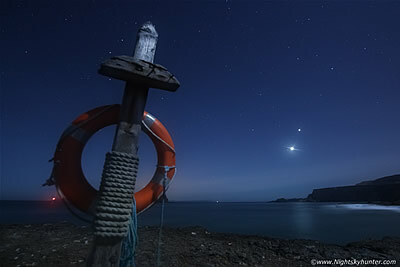 The first half of the night was spent at Dunseverick waterfall which looked spectacular under the brilliant moonlight with stars aloft, then at 02.00 UT we relocated to the Ballintoy coastline and time lapsed the rise of the impressive triple planet conjunction between Venus, Jupiter and Mars using four DSLRs and various lenses as the planets rose above a flat sea horizon only 7 degrees apart sporting halos and glitter paths upon the beautiful moonlit ocean in the pre-dawn sky. One page report with 10 images and 1 time lapse video. - REPORT. 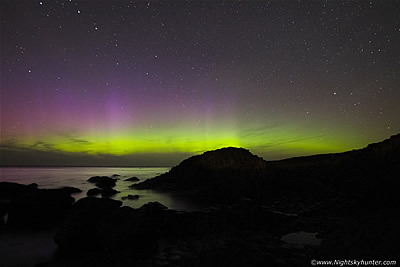 Detailed report documenting a number of photo shoots on Nov 6th, 11th, 12th and 19th 2015 shooting Autumn storms at the Co. Antrim coast, daytime ocean sheared convection, night time thunderstorms over Donegal, time lapse shooting, star trails, aurora activity, Taurid fireballs then ending with a stunning Leonid fireball over Lough Fea which produced a smoke train visible to the naked eye for 15 min's. One page report with 11 images and 3 video clips featuring time lapse footage. - REPORT. November 20th 2015 brought the first taste of Winter to N. Ireland. 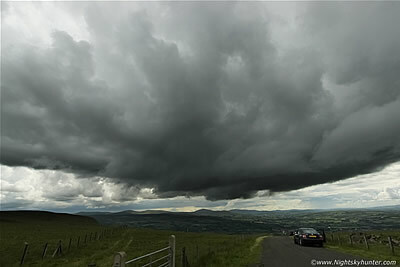 I spent the afternoon doing a solo chase across Glenshane Pass where I encountered my first snow showers of the season complimented by mammatus clouds followed by further snow, hail and mammatus observations from the summit of Benbradagh where I had three video cameras documenting the action. 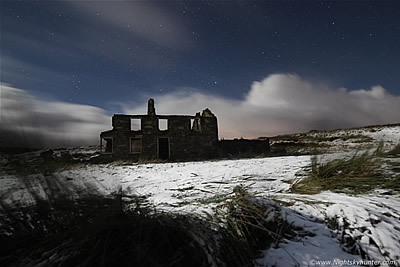 After dark I met up with John Fagan and together we battled the elements back on Glenshane in a deadly wind chill as we attempted time lapse photography in strong squalls and acquired our first moonlit snow images of the season at an old favourite derelict house on the mountain. On page report with 6 images and 1 video clip. - REPORT. 'Exposure' - 2015 highlights video featuring 28 min's of video and time lapse sequences showcasing thunderstorms, flooding, winter scenes, sunsets, noctilucent clouds, night sky, aurora displays and even footage of jelly fish and basking sharks. All of this footage was captured within N. Ireland covering hundreds of hours and hundreds of miles chasing across the countryside in search of dramatic photo opportunities. Best viewed at 1080p HD, I hope you enjoy it, thanks very much for watching.